GA’s new Boston campus is located in a 22-story, modern steel and glass skyscraper, which in 1989, was constructed on top of an original 19th century granite and cast stone building. 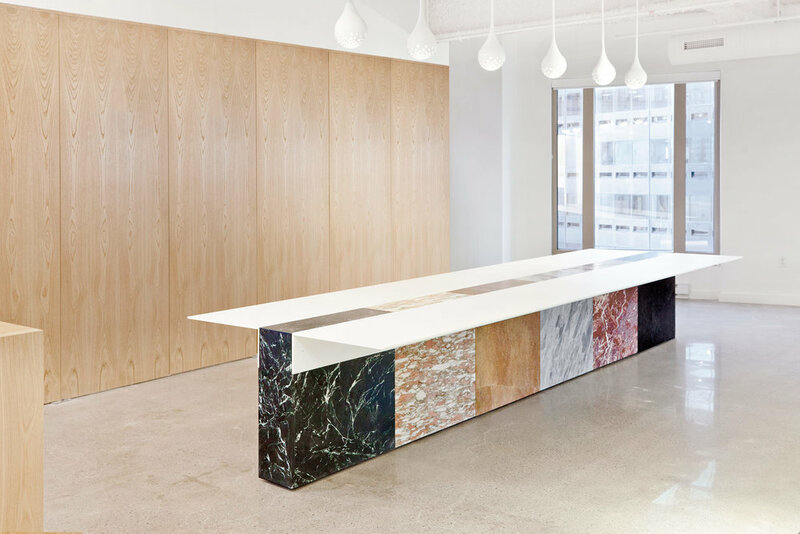 Taking inspiration from the unlikely combination and stacking of architectural styles, our custom communal table features a 16’ long mixed stone plinth which serves as a foundation for the steel table tops which appear to hang from the sides of the stone. Our custom table was designed, engineered and fabricated (in Los Angeles) into 14 separate components which were easily shipped and assembled once on site in Boston. The majority of the structural components and fasteners were designed to be concealed.